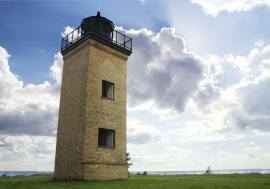 Ghosts and rumors also surround the ruins of the Peninsula Point Lighthouse. A fire destroyed the keeper’s house and today all that remains is the lens tower. The grounds where the lighthouse once resided is a park that comes to life every spring with the blooming of the lilac bushes. The park is complete with an interpretive geological trail, signs explaining the history of the light house, and plaques discussing the Monarch Butterflies that migrate through the area every fall. Visitors can still climb the wrought iron spiral staircase to the top and enjoy panoramic views and the clean breezes of Big and Little Bays de Noc.